One of the advantages of WooCommerce is the ability to add subscriptions. Offering a subscription is one of the best business models because it’s built-in recurring revenue. WooCommerce doesn’t handle subscriptions out of the box, but a subscription feature can easily be added with an extension. There are several ways to create WooCommerce subscriptions. In this article, we’ll take a look at the top 6 plugins to add subscriptions to your WooCommerce store. The plugins are in no particular order. First, let’s look at why you need them. Subscriptions allow you to automatically bill for recurring payments based on a set schedule. Recurring payments provide a consistent and scheduled income, and it retains your current customer base. You can have multiple weekly, monthly, and yearly subscriptions for many types of products including virtual, physical, and online or onsite services. WooCommerce makes this easy to set up and manage. This means you can charge for an ongoing service such as access to digital downloads, access to subscriber-only content, monthly magazines, reviews, videos, audio, courses, tutorials, podcasts, streaming services like Netflix and Hulu, etc. You can even charge weekly payment plans for onsite services such as lawn care, babysitting, pet care, etc. Subscriptions are a great pricing model for WordPress-related products. For example, you can sell yearly access to members-only downloads such as themes and plugins, or support for those themes and plugins. You could sell a monthly service such as hosting or a website maintenance plan. Technically it’s possible to handle subscriptions manually. It is possible to simply charge your customers every week, month, quarter, year, etc., but there is a lot that goes into the subscription. First, there’s access. You have to have an easy method of knowing who has access to what, when that access will expire, how much access they want to purchase, and you need an easy way for them to make changes to their subscriptions. Then, you have to provide the access. For billing, you’d have to send each person an email reminding them that you’re going to charge their account. If their credit card expires you’d have to contact them yourself. If they want to cancel their subscription they’d have to contact you directly and then you’d have to decide when to stop their subscription and how to bill them. They’d also have to contact you if they wanted to upgrade or downgrade. This is just scratching the surface of the types of problems you could face by handling subscriptions manually. All of this sounds like a lot of hassle even from just a few subscribers. Now imagine if your number of subscribers multiplied. You’d be so busy handling their accounts that you couldn’t do any other work in the business itself. Using a WooCommerce subscriptions plugins automates all of these problems including the many problems we didn’t even cover here. It’s easy to see how the plugins will pay for themselves. WooCommerce Subscriptions is the standard subscription add-on for WooCommerce. It’s an official WooCommerce product and includes multiple billing schedules and integrates with over 25 payment gateways. It supports manual updates with automatic email invoices and receipts for any of the payment gateways. It includes renewal notifications and performs rebilling for failed payments. Add signup fees, offer free trials, set expiration dates, provide coupons, etc. It support variable pricing, so you can have multiple options for a product with different prices for each option. Subscribers can manage their plans themselves so you don’t have to help them with upgrades or downgrades. It provides detailed reports so you can track revenue, subscribers, etc. 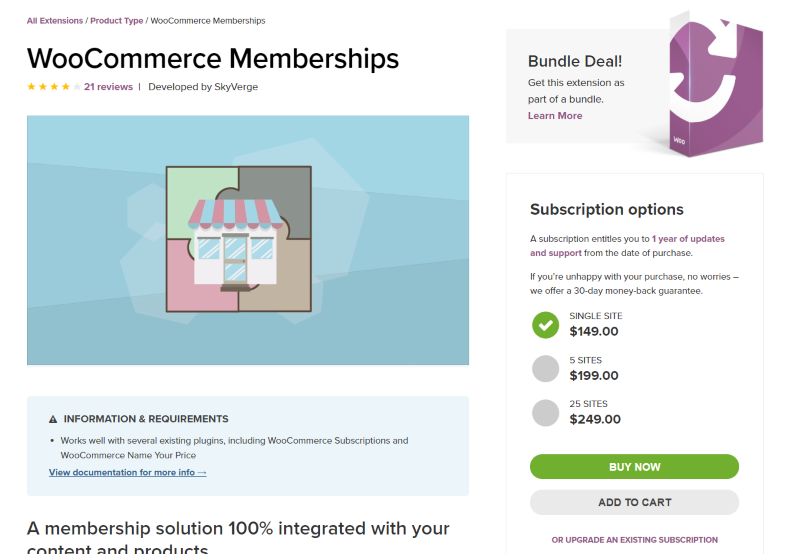 Although it’s more limited than WooCommerce Subscriptions, WooCommerce Memberships also provides a subscription system. It’s an official WooCommerce add-on that brings your content, shop, and memberships together to create a site-wide platform that allows access to certain on a subscription basis. It allows you to drip your content over a period of time so you can schedule when members have access. You can sell memberships as a stand-alone product, include memberships with a specific product or several product purchases, and add member perks that integrate into your store. You can also manually assign memberships as an invitation-only type of membership program. YITH WooCommerce Subscription lets you make your products accessible on a subscription basis. You can make them accessible for a scheduled time (choose from the number of months or number of days). Create unlimited subscription plans for virtual products and set the type of renewal for each product. You can charge a monthly or daily fee for the subscription. 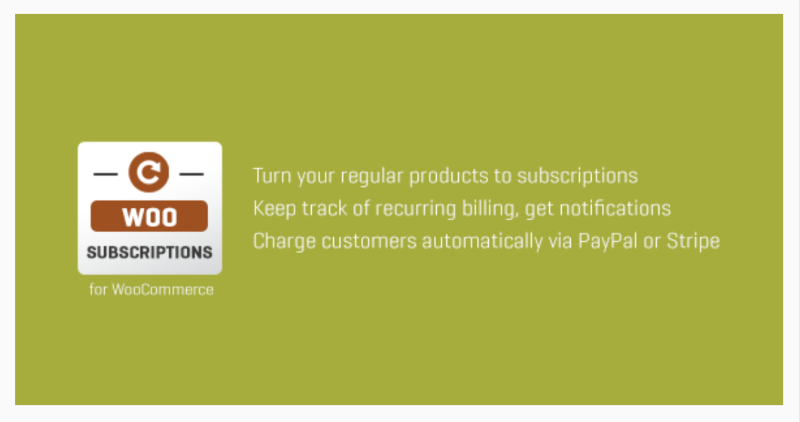 Customers can stop their subscriptions directly from their PayPal accounts. It has a free version in the WordPress depository or you can get a premium version that lets users pause and resume subscriptions, lets you offer a trial period, adds physical products, adds 2 new coupons, and lots more. Subscriptio from RightPress lets you sell simple and variable products as subscriptions. You can set the payment cycle, subscription length, free trial length, and you can even add a setup fee if you want. You or the customer can pause, resume, or cancel subscriptions. You can disable this feature for customers if you want. Set when reminders will be sent and the length of the suspension period. Allow customers to purchase both subscription and non-subscription products during a single checkout. They can purchase multiple subscriptions with any quantity of each subscription. It displays related products and related orders. It includes hooks and filters for developers. It also integrates with RightPress’ WooCommerce Membership plugin. 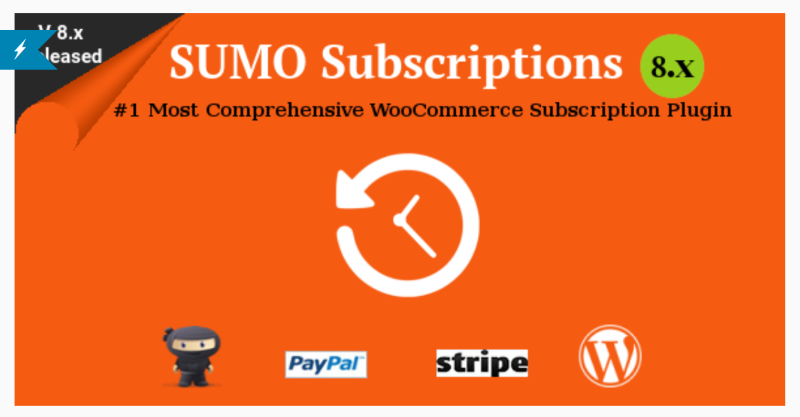 SUMO Subscriptions claims to be the most comprehensive WooCommerce subscriptions plugin. It does offer a lot of features and it’s compatible with seven other SUMO WooCommerce plugins. It provides simple subscriptions, variable subscriptions, and grouped product subscriptions. Users can select the duration and number of renewals for their subscriptions. It has payment synchronization and lets you pro-rate the amount for the synchronized subscription. Customers can purchase multiple subscriptions and subscription and non-subscription products within the same order. It includes automatic renewals with PayPal and Stripe, and you can perform manual subscriptions. It supports free and paid trial periods. It’s highly customizable and translation ready. This one isn’t actually a plugin, but PayPal has a recurring payment feature that integrates with WooCommerce. 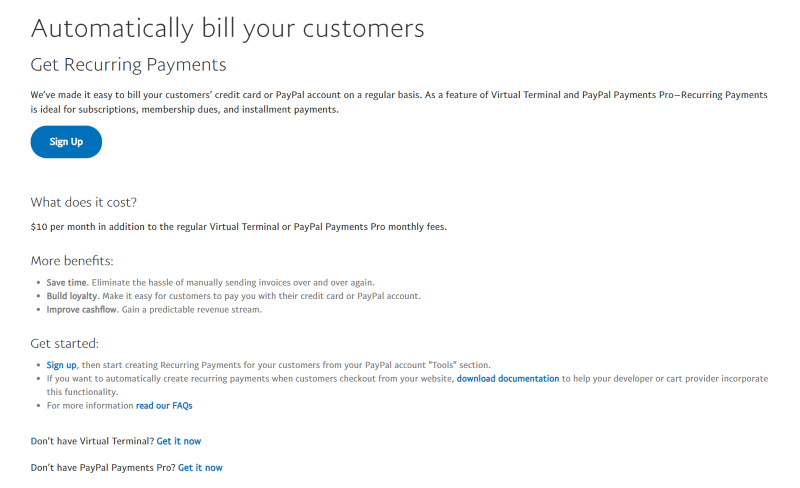 This is a feature of Virtual Terminal and PayPal Payments Pro. It also allows you to collect automatic payments. It’s not as feature-rich as the other options on this list. For example, PayPal doesn’t let you directly sell variable products (meaning that you have different versions of a product with each version having its own price), but it does allow for recurring payments through the PayPal system which already connects to WooCommerce as a default gateway. This is a great choice to use for installment payments. That’s our look at the top 6 Plugins to add subscriptions to your WooCommerce store. WooCommerce subscriptions are a great way to create ongoing revenue and the plugins on this list make it easy to set up. There’s something here in all price ranges, and even the free version of YITH might be enough for many online stores or at least get you started until you can upgrade later. Whichever you choose, you’ll be able to take advantage of one of the best, if not the best, business models available. 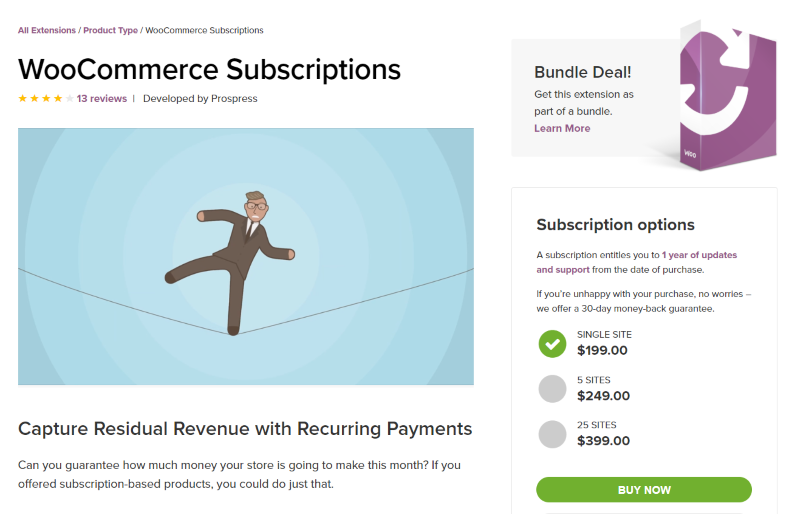 Do you use WooCommerce subscriptions for your online store? Let us know about it in the comments. Great post. All of the plugins you mentioned seem to be really feature rich, but which one of them do you think is easiest to set up and manage? Great to have all these WooCommerce plugins at one place. I was setting up my new site, glad I landed to this post, you save a lot of time in researching each one of them.